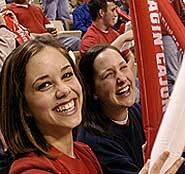 High school juniors and seniors from across Louisiana are invited to visit the University of Louisiana at Lafayette during Preview Day on Feb. 20. This is an excellent opportunity for students and parents to learn more about the university, meet with current students and faculty, and tour campus and residence halls. Preview Day begins at 8 a.m. in the Student Union Ballroom and ends at 3 p.m.
An academic and student organization expo will be available for students to peruse during registration. Following registration, students will be welcomed by the administration and then will attend the academic showcase according to their major of interest. They will learn more about the academic curriculum, meet faculty, and tour the academic departments. Interest sessions will also be conducted covering financial aid, TOPS, scholarships, residential life and the Honors program. The formal program concludes at 2:30 p.m. Preview Day is a free event and parents are invited to accompany their student. Lunch is provided. For more information, visit the Enrollment Services section at www.louisiana.edu or call (337) 482-6467 or (800) 752-6553.